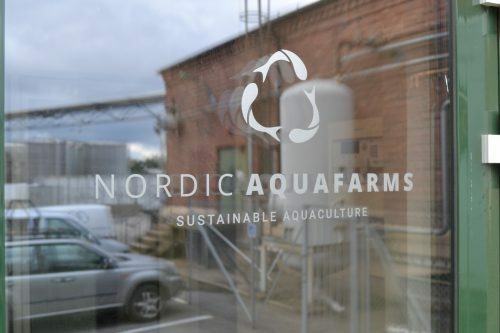 Erik Heim, Managing Director of Nordic Aquafarm, has experienced the difficulties of being a pioneer in land-based farming in Norway. However, he does not let his emotions take control when things don’t go as expected. We are visiting the city of Fredrikstad, just about an hour’s train-ride outside Oslo. 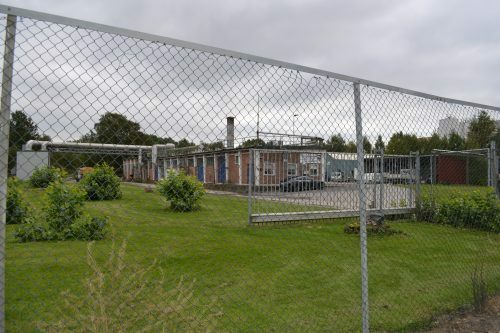 Here in an industrial area, Fredrikstad Seafood is building Norway’s first land-based commercial salmon farm. The project has been delayed due to different reasons. The latest is a dispute between Fredrikstad Seafood and the Danish contractor Graakjaer. Although the conflict is still ongoing, the work has restarted. “That’s how it is with a contract, when it’s signed, the project should be completed,” explains Heim. But even with the delays in Fredrikstad, there is still enough work to keep the company occupied. In Denmark, the company has three different land-based farming projects in three different phases. “We have been involved from the start in Denmark. We have seen the projects in context. The advantage is that the design is similar in many ways, but we are working on a different species, so it is not completely comparable. But overall we are concerned with extreme detail focus, extreme discipline and competence in these projects,” he says. Heim shows us the area where the salmon processing plant will be set up together with the rest of the farm in phase two. The salmon processing plant will be finished at the same time as the rest of the farm. The reason why the company is also setting up a salmon processing plant is that there are no similar projects nearby. “Is it tough to be a frontrunner?” we ask. “It’s always tough to be a frontrunner,” he says and laughs. 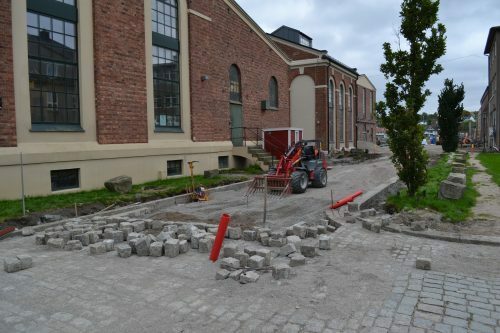 A few hundred meters away from the construction site is Fredrikstad Innovation Park, where the company has its offices. Does Heim feel any pressure to succeed, especially in relation to stakeholders? “Not really. The pressure we put on ourselves, and we are committed to realizing our own plans. We have a good relationship with all the stakeholders. As long as we maintain focus, there is no reason why any of them will be disappointed,” he says confidently. The company received the first land-based permit in Norway in the autumn of 2016. Eagerly, he explains about the pipelines that will deliver water from the local river Glomma through a treatment plant. “We have stripped the entire building. The building will contain the entire water treatment of our intake water for phase one and phase two. In practice, this will be a major treatment plant,” he explains. The plant will be finished by Christmas. However, it is quite quiet on the construction site; most employees are out for lunch. Erik Heim introduces us to three of them. In total Fredrikstad Seafood has seven employees. It is quite obvious that Heim is trying to build a team where members complement each other, with a strong focus on competence. Roger Fredriksen has worked in fish farming since 1981. Most of his life he has lived in Northern-Norway, now he is living in Fredrikstad. This is actually the second time he has been involved in building a land-based plant. First time was in the 90s, when he and his father tried to set up a similar project. It only lasted five years. Now he has a chance to see it done properly. “Maybe it’s a small revenge,” he says. “You were the true pioneers!”, shouts Heim. 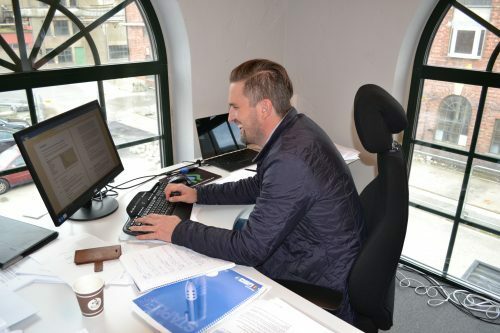 Together with Fredriksen’s solid background from sea pens, the company has also hired Irishman Cathal Dinneen. Dinneen is among the most experienced in the world for the production of salmon in RAS systems. According to Heim, there is a conscious strategy to bring in the best of different worlds. 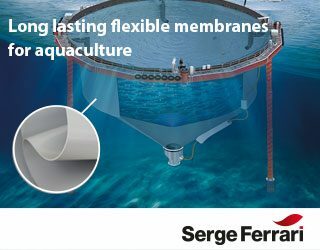 “The strategy is to combine long experience from land-based and sea pens, so we have both perspectives. It is very important,” he says. Dineen moved to Fredrikstad eight months ago. “We have everything here that the family needs, and I feel very happy in Fredrikstad. The town is great. The most difficult things are the language and the cost of everything,” he says. But even living costs in Norway are small compared to the investments made by Nordic Aquafarms. 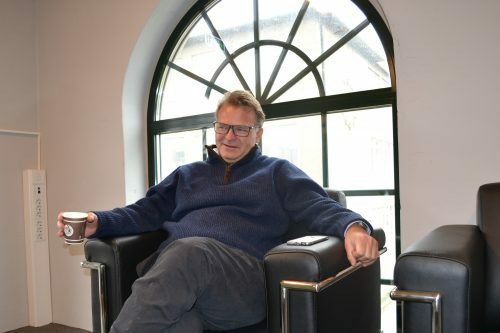 “Investments so far are around 32 million euros, but there are a lot of phase two investments already in progress,” says Heim. To keep track of the finances, the company brought in Lars Henrik Haaland a year ago. 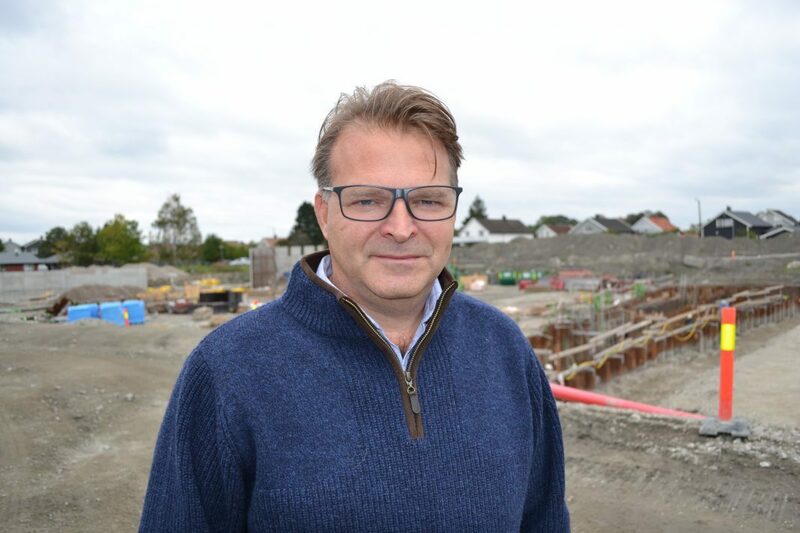 Haaland, who has worked with Siemens and the oil industry, started on 1 October as Chief Financial Officer in Fredrikstad Seafood and Nordic Aquafarms. “I do not know much about fish, but have learned a lot in the past year,” he says. Heim underlines the importance of competence. He has learned a lot himself since he started the project. But why did Heim, born in the United States, raised in Oslo, chose Fredrikstad as a destination for his project? But according to Heim, Fredrikstad is in not the end-station. Several companies have in recent years tried to succeed with land-based production, but few have made it. Heim has a theory why this has been the case. “One of the most significant barriers has been funding. It has been very demanding to finance. I have contact with many projects internationally. One in five has managed to build in the last 3-4 years. It takes a long time, due to financing. It requires you to bring your own muscles on the ownership side; we have been lucky. It is the biggest obstacle. We see many projects with big plans, but many do not have the skills or capital to succeed. Therefore, we have been keen to put both in place. We invested early in expertise. We were out early and quality-assured the entire production project, long before we go into production. It’s an investment from us before we go into production,” he says. “We focus on what we do, so others must focus on what they can do. We want to set the standard for ourselves and we have clear goals in terms of competence, quality and risk management. If others want to perceive that it is the standard, they will find out,” he says. Just getting bigger is central to the philosophy of Erik Heim. He believes growth in land-based production will not go beyond farming in the sea. He emphasizes that not everything has to be salmon. 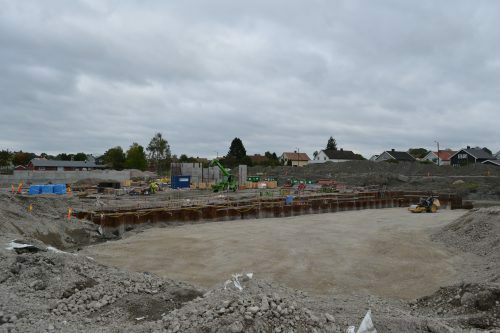 But even though the phase one in Fredrikstad has not gone according to plan, Heim claims that he was prepared for it. Letting emotion take control of him was never an option. “You can not sit down and get angry when delays occur; one has to turn around to fix things. Obviously, it’s frustrating, but the day you sit down and get annoyed, then it’s game over. You must not give up, just move on,” he concludes.